Air Conditioner Cleaning | Why Important ? Air conditioning has become the main item in several homes, shops and offices all over Dubai, which is a country with a typically warm climate. Its operation is simple: it captures external air, cools and replaces warm ambient air with it. With the use (even if it is not constant) and with exposure to the environment, the air conditioning filter accumulates waste like dust and animal hair, which obstructs the air outlet, so it is important to maintain it. This is due to the dirt that can prevent the air from escaping. So you need to check the AC duct and clean it to get it back to the expected performance. When the air duct get dirty, they reduce the performance of the equipment and the quality of the air gets worse. To prevent these faults from occurring it is important to maintain the AC cleaning Dubai periodically. We at Moltocare, a professional company, thus preserving its functionalities and avoiding serious problems that may require bigger repairs. Therefore it is necessary to get cleaned the air ducts once a month or more. In addition, the lack of air conditioner duct cleaning is one of the main responsible for the proliferation of fungi, mites and bacteria in the air-conditioned environment leaving you, family, clients and employees sick. Dust accumulation can obstruct the filters, the turbines, the heat exchange coils, compromising their perfect functioning. Such parts can only be properly sanitized by a trained professional who will do the whole process correctly and will ensure the safety of your service. The air conditioner used very often needs to be periodically cleaned and a deeper one every six months or annually, as there is more dust accumulation. And the unused appliance also needs care to prevent rusting, especially in coastal towns. Dust installed inside has fungi, mites, bacteria and other pollutants (depending on the environment), which can cause respiratory diseases, frames allergic and skin problems, so it’s important to know how to clean the air conditioner. It is imperative that the appliance has a professional cleaning, at least once a year. The dirt accumulates naturally in duct and becomes the environment conducive to the breeding of fungi and bacteria. At the end of the procedure a bactericide is applied to prolong the cleaning effects. The waste in the air conditioning prevents its full operation, forcing the compressor to air-conditioning the environment, which requires more energy. In other words, it always works at maximum power to try to cool down and never succeeds. With specialized cleaning, you invest in a safe service annually, and avoid further expense when you encounter a major problem with your device. Spend less on foreclosure than fixing a mistake. 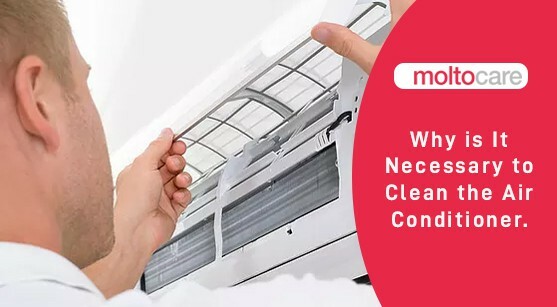 With AC cleaning Dubai services available at Moltocare, the air conditioning environment becomes healthier, reduces the cost of energy, prolongs the life of the equipment and prevents the burning of compressors and motors, which have a high cost to repair.